When the GT350 was finally unveiled and the automotive world finally got to give the new Shelby a once-over, the first question people had is “can I use (insert part name) on my S550?” Creating a vehicle like the Shelby GT350 requires more than just a team of the brightest engineers; with a myriad of new components from the wheels up, unimaginable sums of money must be spent on research and development to ensure everything will perform as planned. However, with the GT350 being priced as competitively as it is, there isn’t a whole lot of margin to make that back—which is exactly were the catalog of new Ford performance parts comes in. Although Ford said the prized jewel of the new GT350—the flat-plane crank 5.2L “Voodoo” motor—will not be found in any other Ford vehicle, a lot of the parts that make the GT350 so special will be available for your S550. One of the first parts to set the Internet forums ablaze was the newly designed GT350 intake manifold that flows air into the 526 HP 5.2L Voodoo motor. Independent shops have already begun testing the differences between the stock intake and the GT350’s, which has yielded some incredible results. One shop that did the swap saw gains of up to 60 RWHP and 43 RWTQ, at a new peak RPM of 7,300 on an otherwise stock ’15 GT performance pack. The new intake design seems to have an improved low end response, with the major gains in power coming in on the top end, which isn’t a shock considering the GT350’s motor was made to rev to 8,200 RPMs. Seeing as how swapping out intake manifolds was so popular on the ’11-’14 Mustangs (Boss and Cobra Jet Intakes), it is safe to assume that this will be a common upgrade for those looking to stretch their power band. It’s impossible to deny that the Shelby GT350 is one of the most aggressive looking ‘Stangs to come from the factory in the past decade. From the defined front grille to the large, yet fully functional spoiler on the R model, the GT350 is a badass looking Mustang, plain and simple. 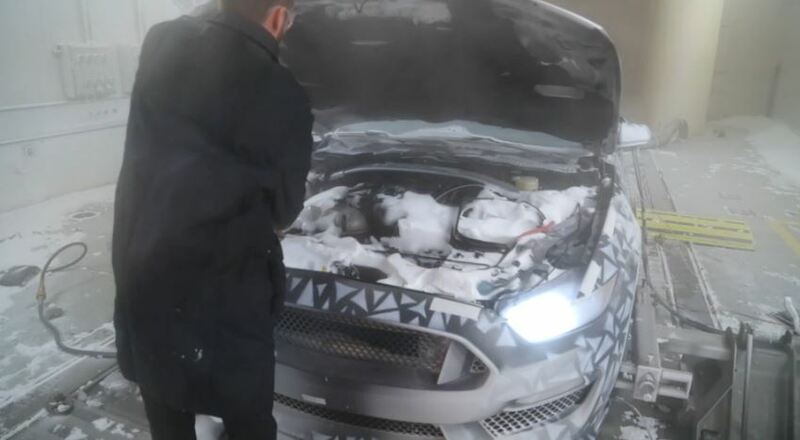 Shops like Ice Nine have already swapped over some of the GT350’s intimidating exterior parts to their SEMA EcoBoost Mustang. Parts like the striking front grille, with its large “fangs” are sure to be common mods, especially considering that it improves engine cooling. Aside from the front grille, the large R spoiler will undoubtedly be another popular upgrade for S550 owners. Designed to apply incredible amounts of downforce, the GT350R’s unique and innovative spoiler will without a doubt be seen on EcoBoosts and GTs alike once it is available. 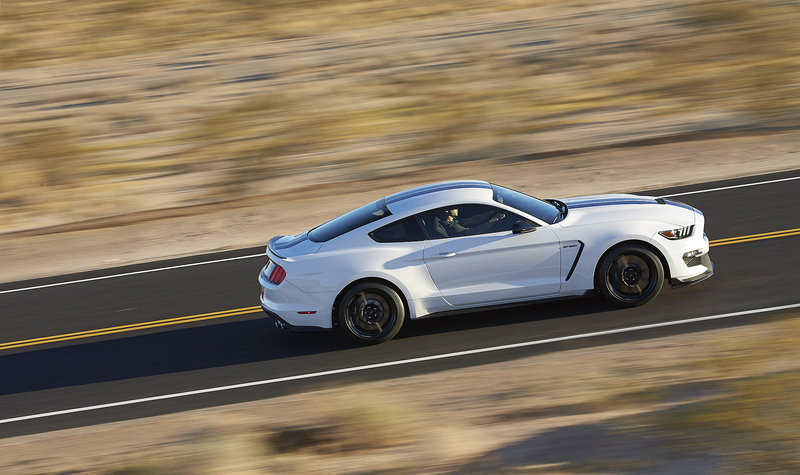 Described by Road & Track as “an engineering nerd’s fantasy,” the GT350’s suspension is in many ways more impressive than the jaw-dropping performance of the Shelby’s motor. 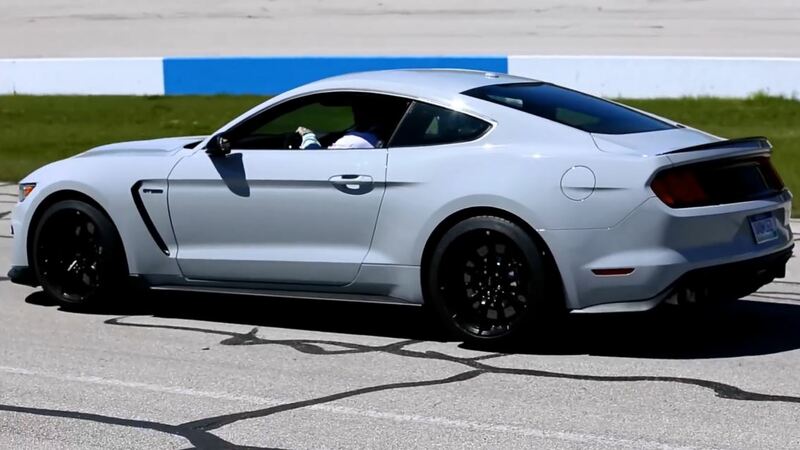 One of the main highlights that helps the GT350 destroy any track it sets a tire to is its “MagneRide” suspension. While it is not exactly the newest in handling tech, Ford’s retooling of the system for the GT350 is what is so impressive. Unlike conventional suspension systems, MagneRide setups have no mechanical valves or small moving parts that will wear out. Instead, the system uses magnetically controlled dampers, or shock absorbers, for a highly adaptive ride. Taking four monotube dampers, one on each corner of the vehicle, a sensor set and an ECU, the car is able to control the magnetic fluid within the dampers for handling that is second to none. The system does add 10 lbs over your average conventional setup; however, the handling benefits far outweigh the minor added weight. Turning from one of the most contested rumors into one of the biggest selling points of the new GT350 is its use of carbon fiber wheels (available on the R version only). You can count on two hands the number of cars that come from the production line with a set of carbon fiber wheels due to their high cost of creation, and every one of those cars that isn’t the GT350 has a price tag more than triple that of the Shelby’s. Setting you back a cool $61,295 (without the despised “adjusted market value” dealer markup), the GT350R comes outfitted with the new carbon fiber wheels. While they shave an absurd 58 lbs of rotating mass off the Mustang, the wheels alone would set back your average GT owner about $28,000, or rather the price of a loaded EcoBoost. Even though that is cheap when compared to other carbon fiber wheels that cost well over $50,000, it will more than likely not be that popular of a mod with that high of a price point. One can dream though, right? One of the first GT350 mods GT owners have made is swapping out the stock steering wheel for the GT350’s leather and Alcantara wheel. 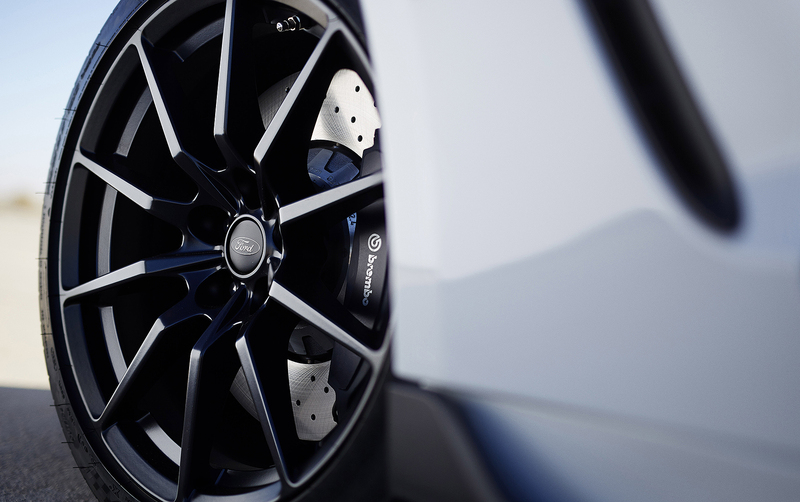 Designed with grip in mind, the GT350’s wheel features a flat bottom and slightly thicker diameter than stock. Accented with red stitching, the GT350 wheel reuses all of the OE equipment, making it a painless and direct swap. It is hard to see many GT owners ditching their factory wheel for the GT350’s, yet its refined look and feel will surely appeal to decent chunk of the S550 community.